We are so grateful for the words of Tyanne Rakouitz. She writes honestly about her need for rest and what God taught her in His presence. Be blessed, and please, take a moment or two to rest with Jesus today. Superwoman! Let me fly right in and save the day says the woman with no wiggle room in her schedule. Sound familiar? That was me just a little over a year ago. Yes. To a new job opportunity. Yes. To contract work at my current job. Yes. To volunteer opportunities at my home church. Yes! Yes! Yes! That’s all I knew to say. No was not in my vocabulary as a woman who is a planner, an organizer, wife, mother, Grammy, and a perfectionist. As you might imagine, there was zero breathing room in my schedule. Each day I rose and labored through my to-do list feeling overwhelmed, lost and lonely. What was I to do…I made a commitment to all these things? But what about my commitment to Christ? It seemed I only had leftovers for Him. Until, August 10, 2017. That day started out just like any other day, but one quick slip on a wet tile floor and, oh, how quickly things change. A shattered kneecap. Surgery comes five days later. And you’re probably thinking, six to eight weeks recovery time, what’s the big deal? How about 20 weeks? Yes! 20 weeks total recovery time for a shattered kneecap. Why? Why not six to eight weeks Lord? I heard…rest my child. You need rest. 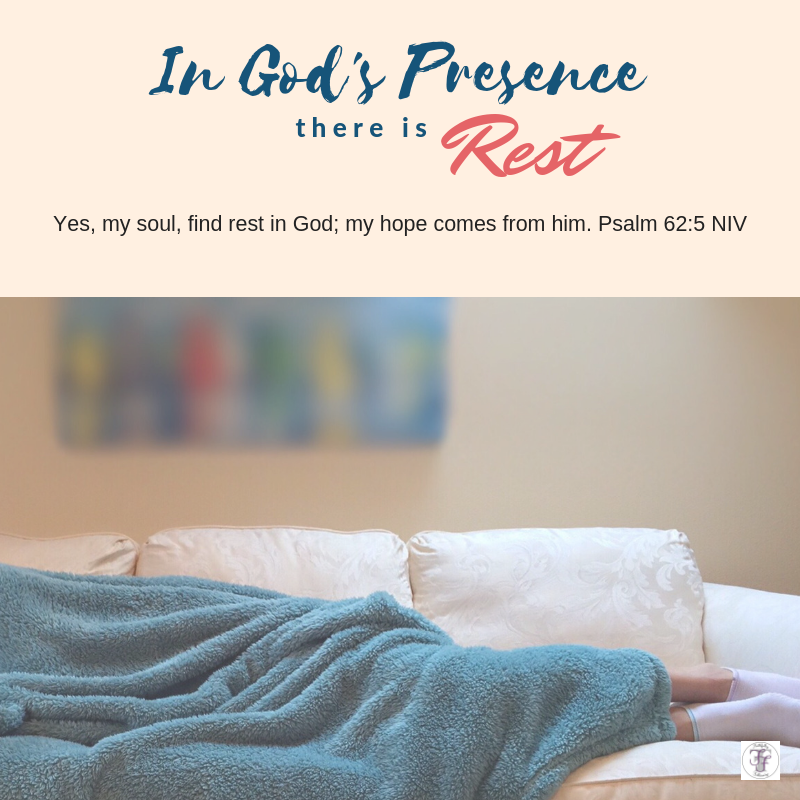 Yes, my soul, find rest in God; my hope comes from him. Psalm 62:5. My youngest child spoke these words to me that day, “What a way to slow you down Mom.” And he was right. It took a shattered kneecap and 20 weeks recovery for me to realize just how much my soul really needed ‘rest’. Not just physical rest, but spiritual rest too. I often wonder if my recovery time had been six to eight weeks, would I still be that lost and lonely woman laboring through her to-do list? Possibly yes. But I stepped away from volunteering, completed my commitments and took a six-month sabbatical from any extracurricular activities outside my family and job. In this time, I leaned in and listened for His whispers. Those whispers remind me, it’s okay to ‘be still.’ It’s not been easy but our Savior deserves far more than leftovers from me. My recovery is far bigger than my kneecap. In those whispers, God taught me this: My identity is not defined by what I do, but by whose I am. Lord, Why do we resist your plans for rest? Help us. Help us to remember how you set a rhythm of rest from the very beginning. Help us find rest in you. Am I taking time to rest physically? mentally? spiritually? Do I often feel like I lack sleep? Am I irritable? 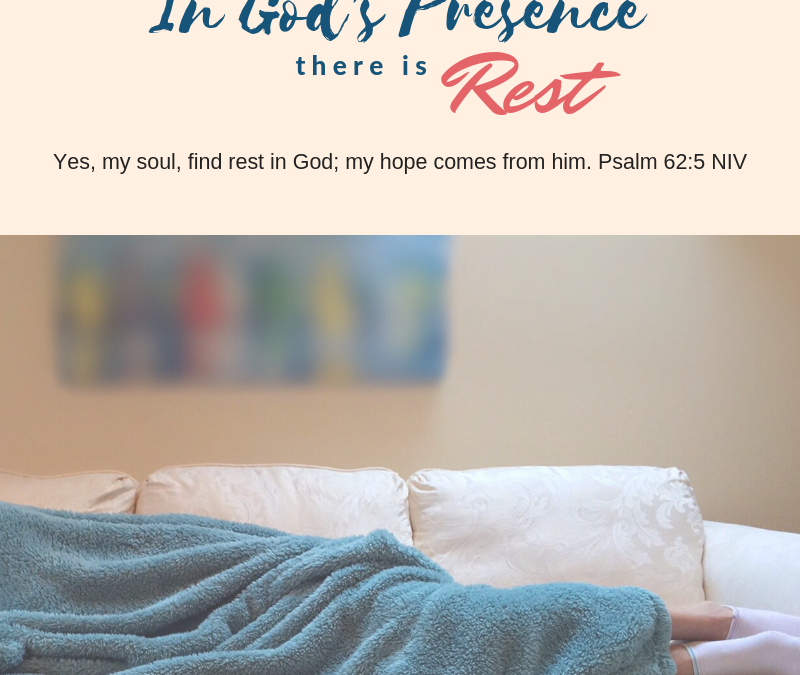 Do I truly know how to rest in God’s presence? Based on your questions write a prayer asking God to help you find a rhythm of rest that allows you to commune with him deeply. In light of this verse, is there anything you can remove from your to-do list and exchange for a time of rest, trusting God to provide. Taking The Risk For Jesus! Making a believer out of me! This resonates with me so very much! I have recently retired, and for the next few months, I will take the time to rest in Him, to be refill, so that, eventually He will overflow in me to others! Thanks Tyanne!